After browsing Facebook as per usual (a bad habit that I’m trying to get rid of) I one day read about something called full water culture. 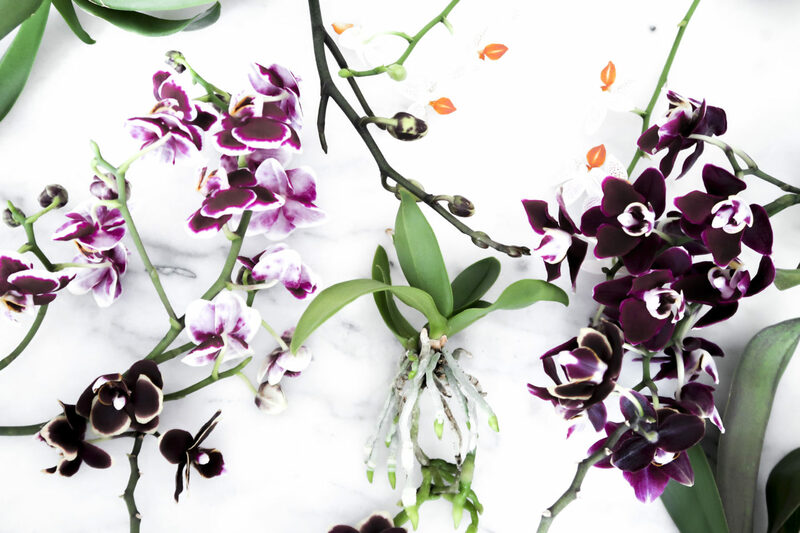 A way to grow orchids using only water. No other potting soil needed. I’ve known for a long time that orchids grow on trees out in the wild but somehow I’ve never thought about the fact that they are perfectly fine without the soil. And since I love plants it broke my heart when my little orchid collection started to lose it’s flowers and the leafs started to crease. Let’s just say that I’m not a person with the greenest fingers. 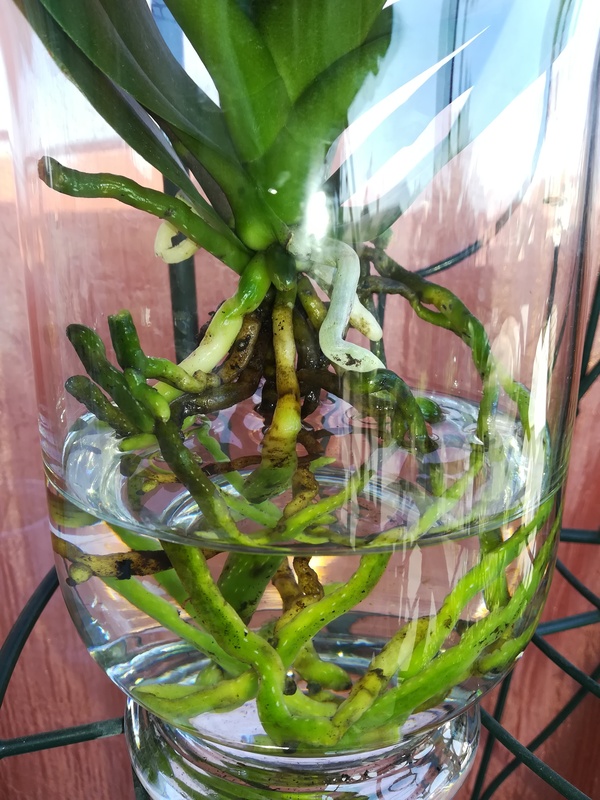 A normal person would have tried full water culture on one orchid and see how it went. I on the other hand put all my orchids into full water culture and in retrospect I’m really happy I did. For the first time since I bought them they are now blooming again. Most of the creases are starting to disappear and the new leafs looks fresh and green. I started this little experiment in the beginning of May, and it’s now the end of July. So this is how much that has happened during the last two months. How does full water culture work? Removing all the soil and washing the roots. Cutting off all the dead roots (the completely dried ones and the soggy ones) to keep the orchid from going moldy. 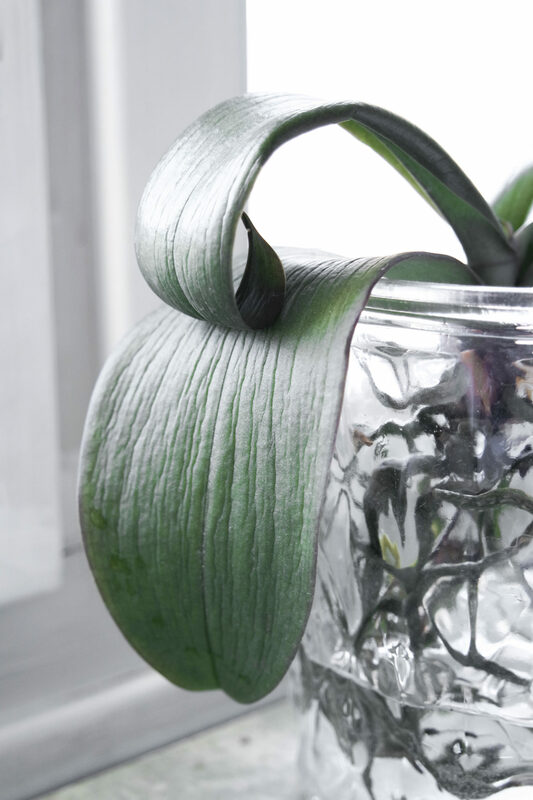 Filling – preferably a clear – pot with about 2 cm of water so only the water roots touches the water and so that the air roots are in the air. And that’s about it! And since it’s very obvious when the water is finished (you can see it though the clear glass) even I can have some green fingers. 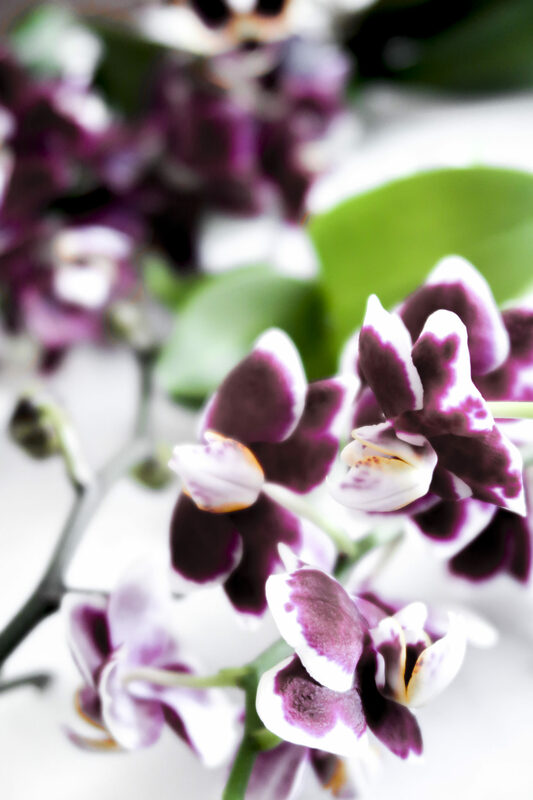 I’ve named my orchids after where I bought them or a fun moment, just because it’s fun to be able to look back and remember. Above you can se some pictures of how they looked before I started full water culture. I’ve bought two new ones since then, those are the white one and the dark purple one with yellow edges. The biggest transformation is the one in the middle on both pictures. It has gone from creased and sad to fresh and blooming! I’ve never had this many flowers on one orchid before! Dirty water also makes the roots moldy. To figure out which roots to remove, simply feel them. If they (the water roots) are dry or soggy – remove them. If they feel like a suger snap in consistency, let them be. A orchid is not dead until all the leaves fall off. 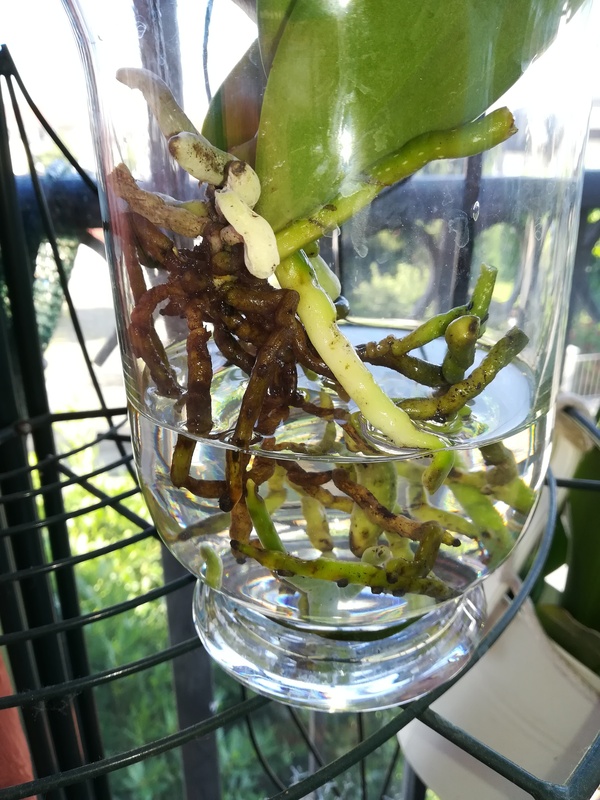 Even if it looks like all the roots are bad there is still a chance for your orchid to survive. 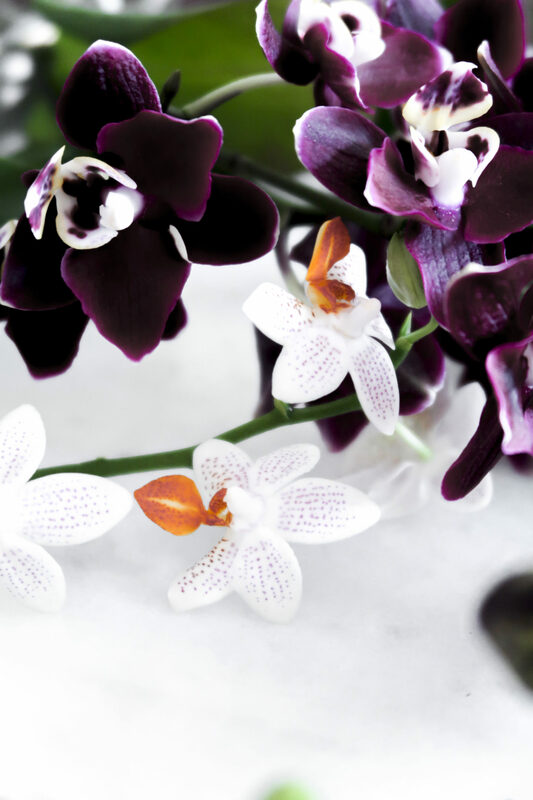 Just make sure that a little part of the orchid is in water then there is still a chance that it will survive. It’s now a breeze to go on holiday because even though I recently killed my ivy and gave my little fig tree a scare the orchids simply kept on blooming! Below you can see my little office-nook that is also the home for my orchids. 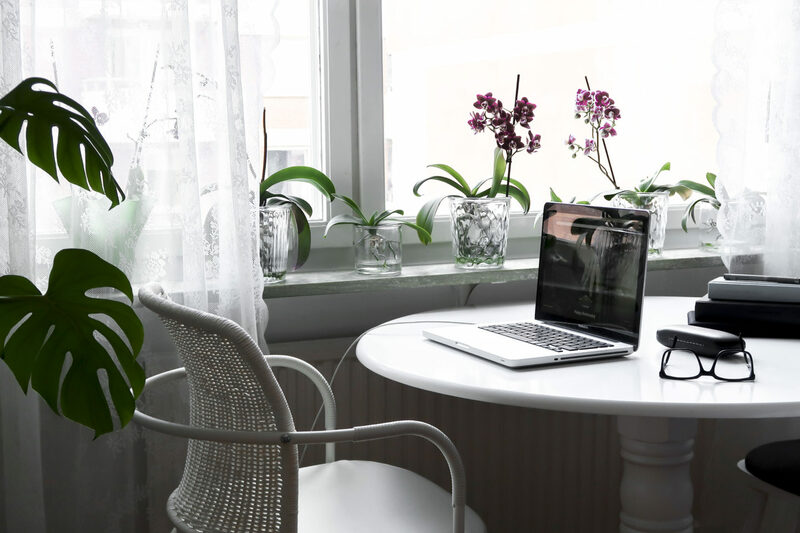 It’s actually our dinner table but during the day it magically turns into my mini-office space! I just love the light and all the green! Hi! Your post is enlightening! Today I started two orchids to full water colture, finger crossed! I wonder are you going on with this kind of colture? 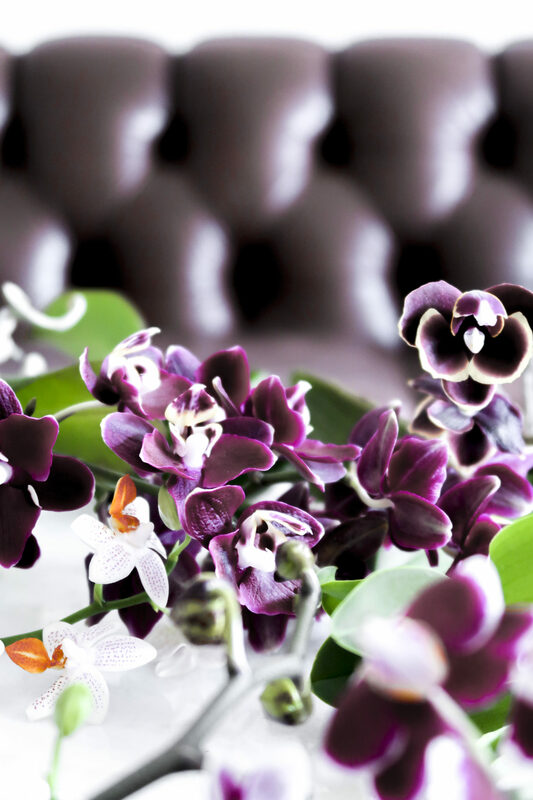 how and how often) do you feed your orchids now? Thank you so much! Hi! Thank you! Glad you liked the post 🙂 Hope your orchids will love full water culture aswell! I usually change the water once every 1-2 weeks (when they either have no water left or if the water starts looking gross) 🙂 I haven’t fertilized my orchids because their roots can get burned if they are in contact with fertilizer too long but might try it in the future! Thank you for your kind reply! I’d like to hear your opinion on my roots, they weren’t the best root ever and I cut them widely….I didn’t want to be too drastic, as well, but maybe I should have been…what do you think?